Do not let any visitors pick up your puppy!, this is the number one cause of injury and even death of Yorkshire puppies. They are surprisingly strong and can unexpectedly jump and kick out of your visitors hands. Recently this happened to one of the puppies I sold and it cost the owner R8000 in vet bills to treat a broken leg and shoulder. I have had phone calls from crying yorkie owners looking for one of my puppies because their previous one fell on its head and died. Needless to say they are not my first choice as owners for my dogs. 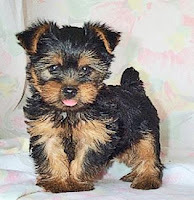 Yorkie puppies are small and need to be treated as such. Their bones are very soft and break easily if dropped or if they jump out of your arms. Do not let them jump off something that they cannot jump up onto.